According to Sanya Visun Royal Yacht Club on 27th March, some yachts which will be put on display in Hainan Rendez-vous 2012, have arrived in Sanya. On 26th March, the ‘Shark Submarine’ yacht, which was brought by Xiamen Smart Hero Yacht Co. Ltd., arrived at Sanya Visun Royal Yacht Marina. The Hainan Rendez-vous 2012 will move to a higher level both in its scale and standard with 150,000 square meters of total exhibition area. The water exhibition area covers 88,000 square meters while the land exhibition area covers 32,000 square meters. Till now, some yachts such as LAGOON450 from France, FlyerGT49 and sense55 made by Beaneteau and luxury yacht horizonMuses120 from Taiwan have arrived at Sanya. 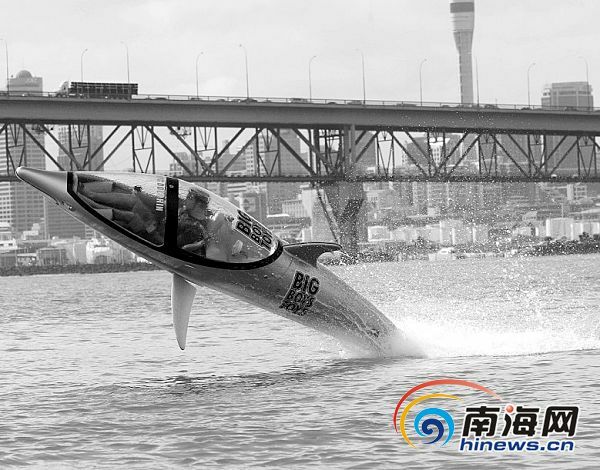 The “Shark Submarine”, which belongs to Xiamen Smart Hero Yacht Co. Ltd, is one of the yachts which will attend the exhibition. It was built based on the model of a shark. Moreover, the size of the “Shark Submarine” is just the same as that of a real shark. It reminds people of the secret weapon of James Bond in 007 movies by its awesome outlook and its exciting functions.